Did you know that buses sometimes stop? Of course, I don't know anything about this, but I'd speculate that the driver of the car cut into the bus's lane, not realizing the bus was stopping. I was out for a walk on Old Georgetown Road in Bethesda and saw this accident involving a bus and a car. There were a couple of (assumidly) Ride-On related vehicles, the bus, the car, three police cars and an ambulance. After a while, a flatbed towtruck and another ambulance came by. The second ambulance didn't stay long so I don't think anyone was seriously hurt. I actually saw an ad on a website for this article and it looked interesting, so I clicked through and read all 10 pages. High Tech Cowboys of the Deep Seas: The race to save the Cougar Ace. It is about a salvage company and their effort to save a car-transport ship that took on water and was abandoned. It talks alot about the people who do this type of stuff and what they did for this particular job. They only get paid if they are successful but they can make a lot of money. There is also an article from the Wall Street Journal about what happened to the cars from the boat. How to Destroy Brand-New Cars. Today I took the day off and went to the fair. 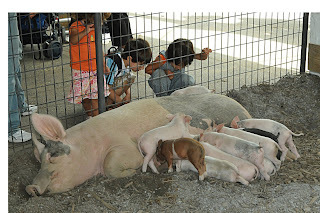 It's a great place to take little kids, although sometimes they are afraid of the animals. When I was a kid, Old Macdonald's Barn was my favorite place, and it still is. Every year they have piglets and ducklings, and goats and sheep, it is a great place to get close to the animals. They have other stuff besides animals, We took a tractor ride around the fair, and sat on a school bus and a Ride on Bus, and the fire department had their big ladder truck to look at and a moon bounce for the kids. There is also pig racing, but I wasn't there for that. Anyway, if you have young kids, the fair is a great place to take them. The fair runs through Saturday, the 16th.